The Mets' ace received another no-decision, allowing three runs in seven innings and striking out 12. 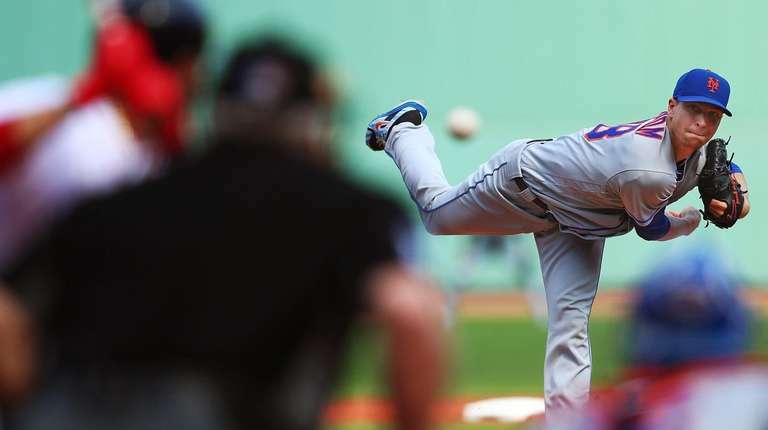 BOSTON — While something less than his most dominant self, Jacob deGrom inched closer to winning the National League Cy Young Award on Sunday in the Mets’ 4-3 loss to the Red Sox. DeGrom held Boston — the highest-scoring team in baseball — to three runs in seven innings. He struck out 12 and allowed five hits and one walk. His 1.78 ERA, up from 1.71 to begin the day, still is the best in baseball — and the best in the National League by a significant margin over the Phillies’ Aaron Nola (2.42) and the Nationals’ Max Scherzer (2.53), who both had rough starts in recent days. DeGrom threw the baseball well, though it didn’t help his team. The loss formally eliminated the Mets from the NL East race. They technically remain eligible for a wild-card spot, with a reverse magic number of two. DeGrom lost control for about four batters — seven pitches — in the third inning. After striking out six of the first seven Red Sox, he got ahead of Rafael Devers 0-and-2 but left a fastball over the plate. Devers lined it to center for a single to become Boston’s first baserunner. Christian Vazquez’s hit-and-run single got Devers to third and Mookie Betts lifted a sacrifice fly. Brock Holt then got hold of a 1-and-0 fastball, also over the middle of the plate, for a two-run homer to give the Red Sox a 3-0 lead. DeGrom rebounded by retiring 12 of his final 14 batters. The Mets tied it in the seventh on Amed Rosario’s two-out RBI single, and after their potential rally in the eighth ended before it began — pinch runner Jack Reinheimer was picked off first base — deGrom ended up with another no-decision. In five starts since his most recent win (Aug. 18), deGrom has a 2.12 ERA. In 13 no-decisions, he has a 1.62 ERA. But he is 8-9 with two scheduled starts remaining. With 22 consecutive quality starts, deGrom tied the major-league single-season record. The two others to do it: Bob Gibson in 1968, when pitchers were so dominant that MLB lowered the mound after the season, and Chris Carpenter in 2005. Boston took a 4-3 lead about as soon as deGrom exited. Tzu-Wei Lin doubled off Seth Lugo and scored on a sacrifice fly by Andrew Benintendi in the eighth. Rosario and Michael Conforto, whose two-out RBI double capped a two-run sixth, had two hits each. The Mets had one hit in three innings against Red Sox ace lefthander Chris Sale — who, by the way, has a 1.92 ERA and thinks highly of deGrom.